My favorite personal memory of this great Yankee took place during a game I attended at Yankee Stadium sometime during the early 1960s, probably 1962. My Uncle always got us field box seats when he took us to the Stadium, somewhere between first base and the right field foul pole. Berra came to the plate and I vividly remember several things about the at bat. The pitch he hit was very high, especially for the short 5’8″ Berra. He hit the ball on a line. It went by me, my Uncle and my older brother like a comet, right at our eye level but still rising. When it hit the drab green painted metal facing of the Stadium’s mezzanine level in right field, it hit it so hard that the clang it made actually echoed throughout the Stadium. I did not see anyone hit a ball as hard as that one until over thirty years later when Jose Canseco hit one out of Fenway that may still have not landed. Of course Jose used steroids and the only juice a urine test might have discovered in Berra’s body was the kind you squeezed out of oranges. Yogi Berra was a marvelous Yankee catcher who won ten championship rings. He had supreme offensive and defensive skills and his teammates loved him. He was also under appreciated as a manager, being the only field boss to win pennants for both the Yankees and Mets. There are so many things I cherish about the game of baseball and having had the opportunity to watch number 8 play the game is high on that list. 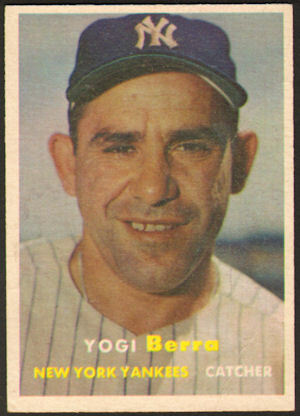 Happy 90th birthday Yogi. Yogi shares his May 12th birthday with this former Yankee third baseman, this war-time starting pitcher and this famous older brother.